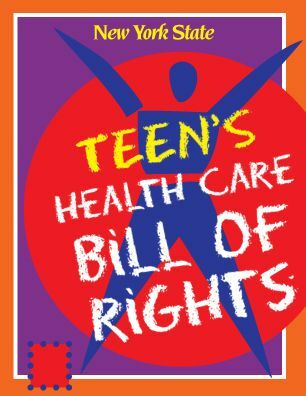 The NYS AAP – Chapter 3 is pleased to offer its “Teen’s Health Care Bill of Rights” (THCBOR) free of charge to Chapter members, hospitals, school based health centers and other agencies that provide services to children in New York State. The THCBOR started as a 2002 Annual Chapter Forum resolution authored by the Chapter’s Committee on Adolescence. Since then, it has been transformed into a professionally written, designed and printed booklet. The eye catching materials, produced with help from legal resources and literacy experts, is written at a 6th grade reading level and informs teens of their legal health care rights. To date, over 145,000 copies of the booklet have been distributed. Funding to print the last three revisions was provided by generous grants from the Children’s Dream Foundation. To place an order, please email your name, the quantity of booklets and/or posters that you would like, and your mailing address to teenhealthrights@ny3aap.org.